SUMMARY: Attended a half-day seminar with Rachel Sanders on running A-frames. Jan 23: I've cut out a bunch from my original post, as it was too detailed to be fair to Rachel. 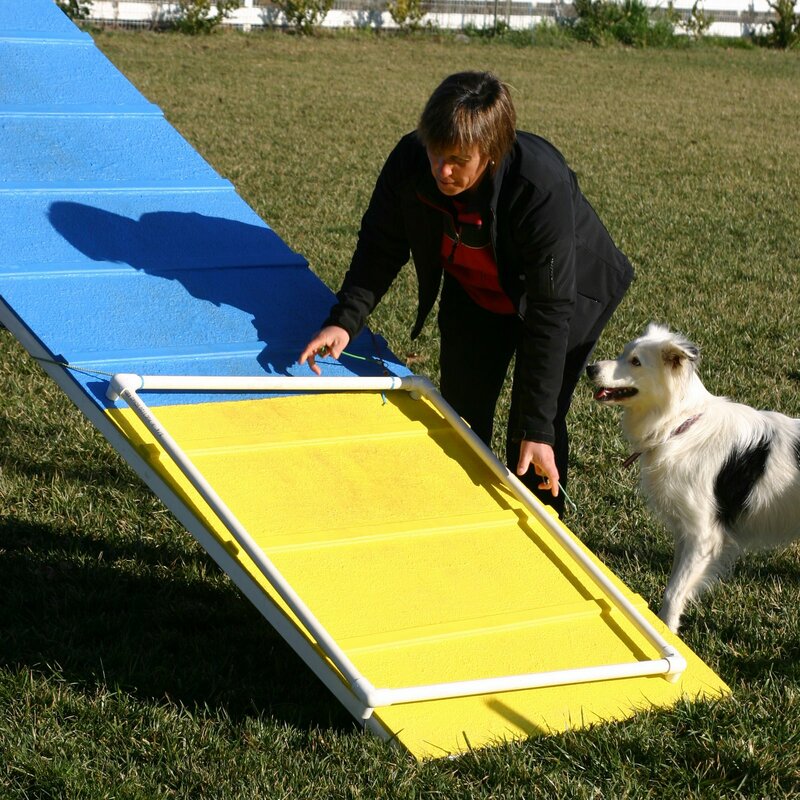 To get the dog to do the down ramp in two strides, hitting all four feet in the contact zone, and leave the A-frame without stopping. For dogs of any breed, any size. 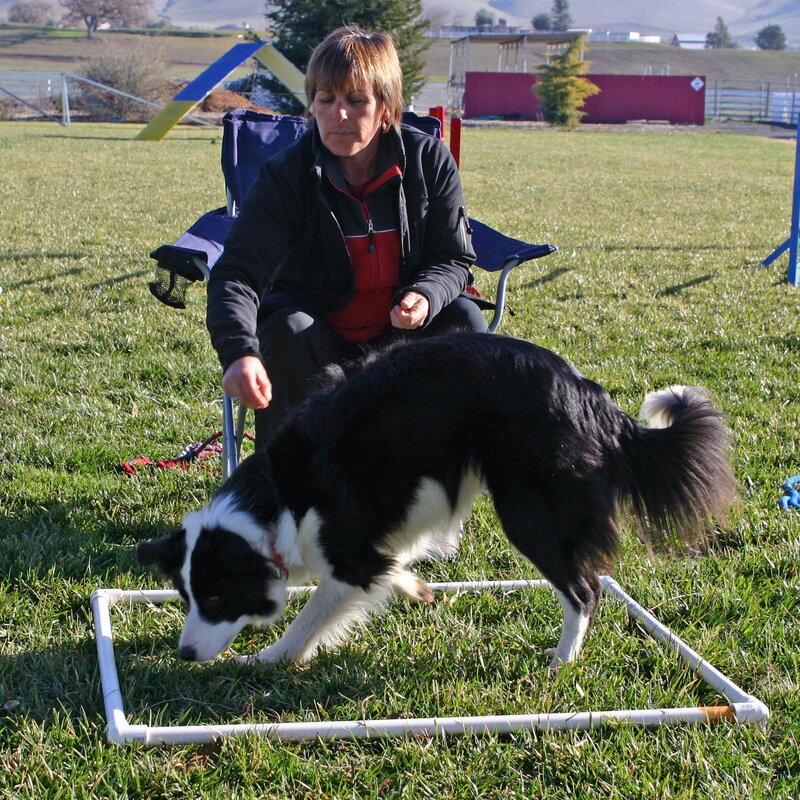 She has now worked with more than 60 dogs with this method, quite a few of whom are competing. She's still refining it as she encounters more dogs with different responses to the method--which is, of course, completely typical for working out a new method. After a 3-hour seminar, jam-packed with info, I am jazzed about the possibilities and realized very quickly that even the 3 hours could provide enough to get me started but not necessarily all trouble-shooting issues and a detailed training plan. I'm hoping to get some more work with Rachel in March. The box will be centered over the contact zone. A "box" made out of PVC. 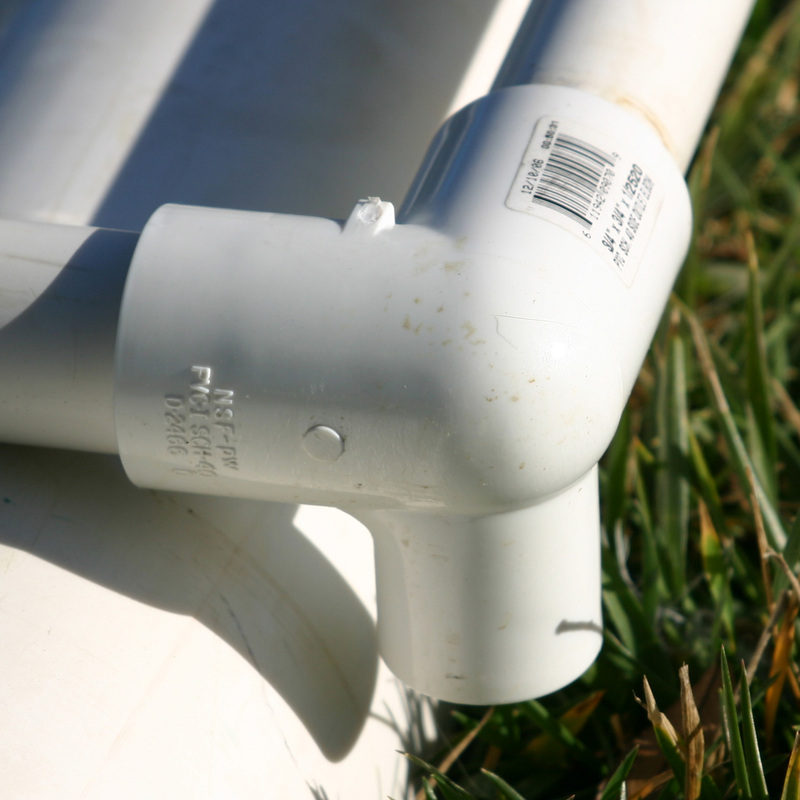 The corners are just standard PVC ells with a third "leg" where a riser would screw in. 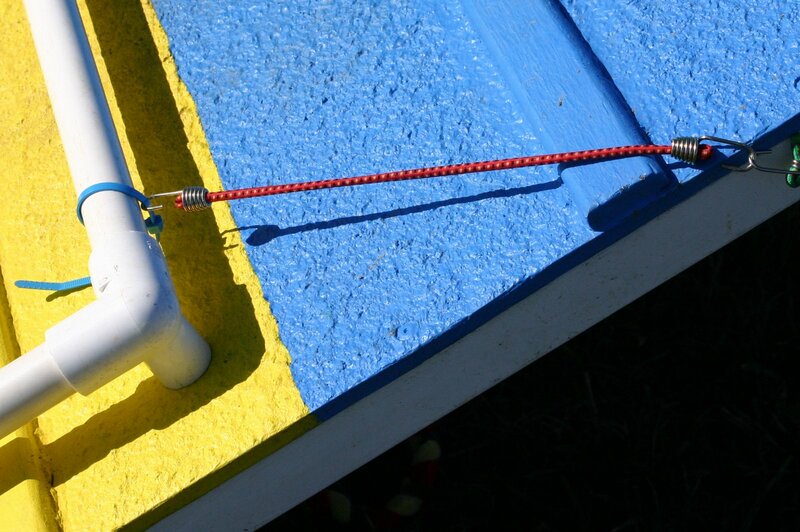 Corner detail Hold in place with plastic tie and bungie to chain underneath Aframe. Click to mark all four feet in the box by tossing the reward away from you. Before you get to the A-frame, you work with the box on the ground, first teaching the dog to go into it with all four feet. First, when the dog shows any interest in the box, click and reward inside the box, away from you. Then reward for all four feet in the box. Eventually, reward motion that carries the dog out of the box opposite the side on which he entered. Toss the treat away from you across the dog's path so the dog doesn't look at you for the reward. Replace the treat with a toy as soon as possible. By now you should lose the chair, but try to find a way to stand where you're not tempted to move, lean, etc. 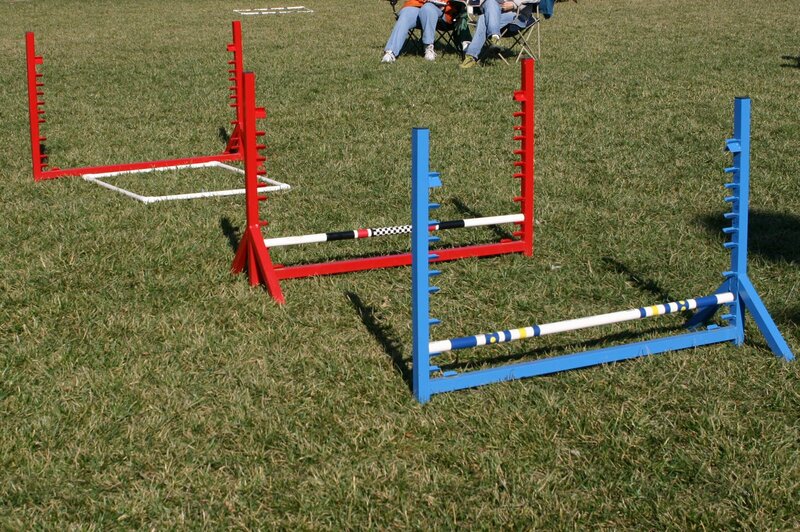 Gradually you work further away from the box, always rewarding only if all four feet land inside the box. 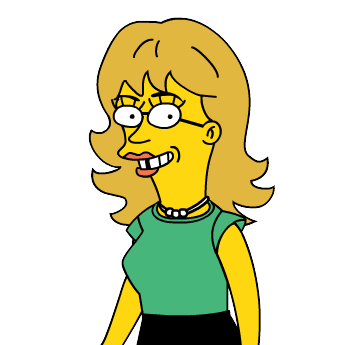 (Rachel emphasizes that the only way that you can train your eye to recognize it is by videotaping and watching your actions.) Then you'd gradually add motion. Same sort of thing as teaching any other obstacle. Flat representation of an A-frame. Rachel also discusses how to practice doing the A-frame without actually having one, using jumps to emulate the layout of an A-frame as shown in the photo. The middle jump represents the apex of the A-frame. The PVC box goes right where it would go on the Aframe. 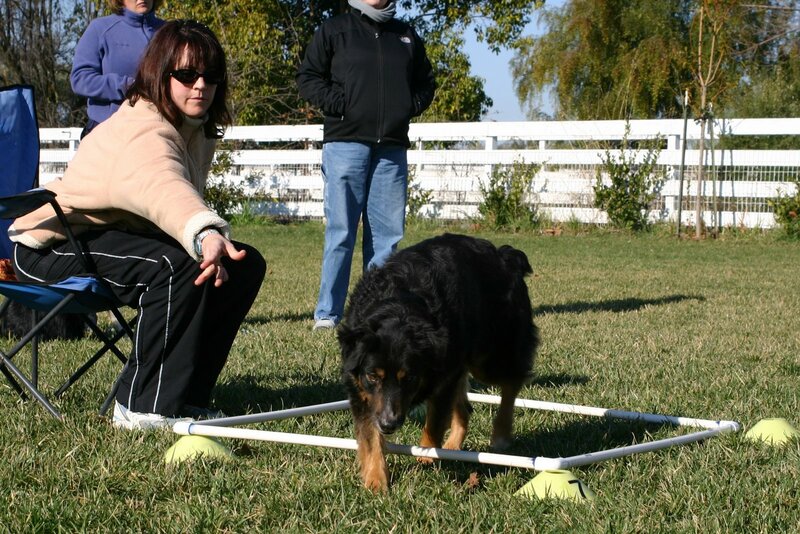 Then work with the dog in the same way you did with just the box--first standing still at different positions, then adding motion from different positions. Goal is always all four feet in the box. Yes, because that's (currently) my main interest with Tika. I'll post something about that now. Very interesting! Thanks for posting the info. I'm amazed that Rachel was OK with you taking pictures and posting this info on your blog. So many people are very guarded about what you can and can't tape, blog, etc. I'm very interested in hearing more about this method. I think I'd like to try it with Devon. I didn't actually ask. It didn't occur to me until this morning when I got email from someone else saying "wow, this is just like being at the seminar," and alarm bells went off--so now I'm checking with her on that. I've checked with Rachel and she said that she believes that people can post what they want, but she's working on an article and a video and is delivering seminars actively right now, plus it's a method still in development, so could I please not give so much detail. I think that's fair. She's OKed this version now. WOW! could you give me an email at admiralsterriers@gmail.com I'd love to discuss this method with you, if you wouldnt mind of course?